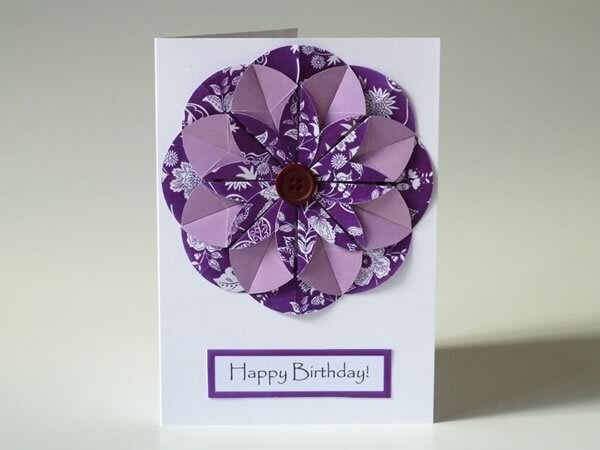 If you're looking for easy homemade card ideas then I'm sure you'll like this origami flower card design! 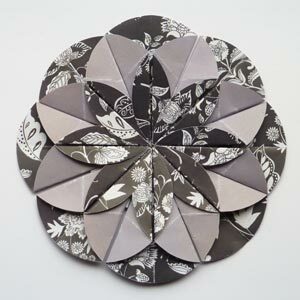 Just download the free printable template and follow my step by step instructions. 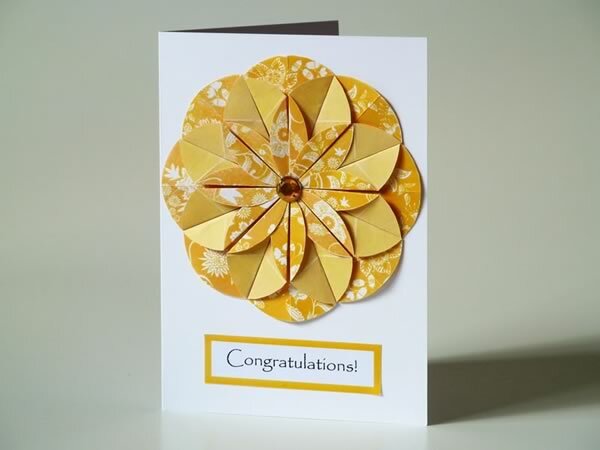 When I'm making homemade cards I must admit that I am usually in a bit of a rush and find myself needing a card *now* and having none in my stash that are suitable! So I've decided to get more organized this year and make some cards that will suit several occasions, and are relatively simple to make at the last minute! 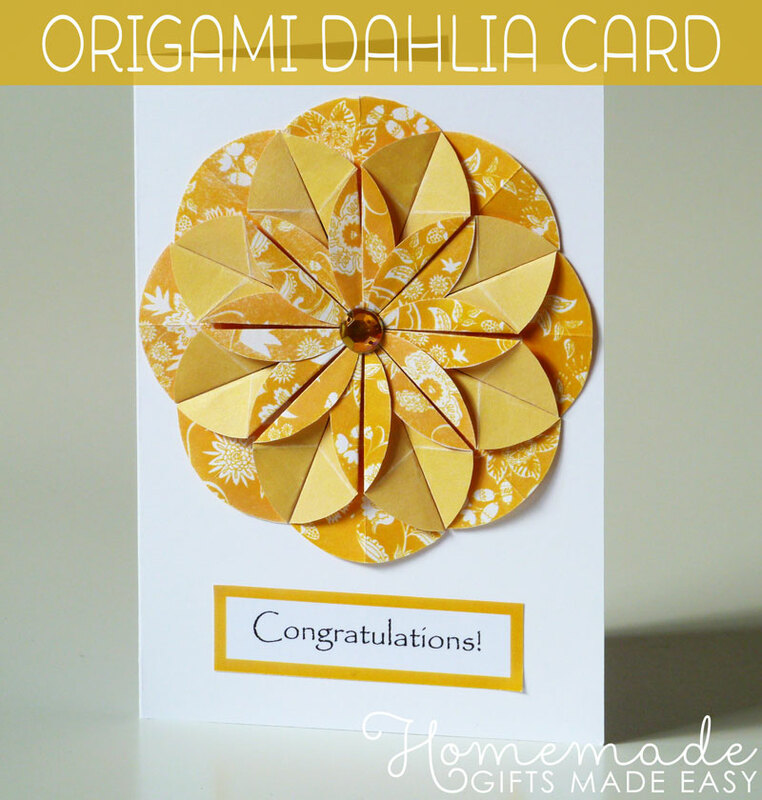 I've always loved homemade card ideas that are simple with only a few embellishments, so when I came across this dahlia origami flower fold I knew it would be just the thing. 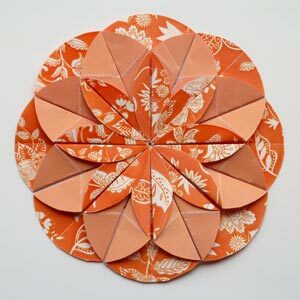 To make the dahlia origami flowers all you need is a circular punch and a supply of pretty double-sided scrapbook paper. If you don't have any a scrapbook paper, don't worry! You can download and print my free digital scrapbook paper, which is a gorgeous double-sided floral design in a rainbow of colors. 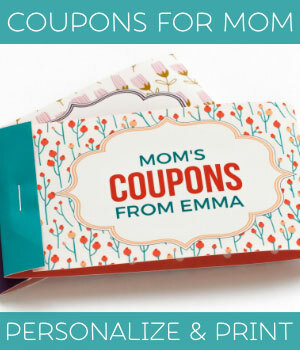 Plus there are lots of sentiments so you can pick and choose depending upon the occasion. For the blank cards, I used some 5" square and 6" x 4" rectangular blank pre-folded cards that I bought from my local craft store. 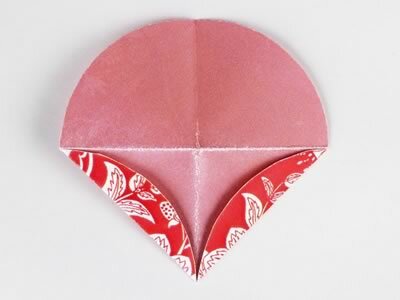 You could also just make your own by cutting out rectangles of card stock and folding them in half. 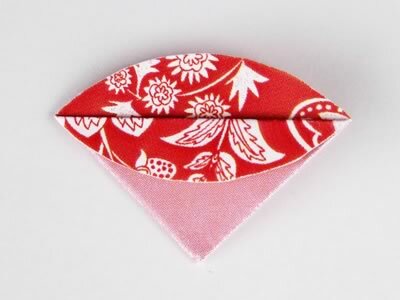 The buttons or embellishments are for the center of the flowers. I think the flowers look great even without an embellishment, but buttons also look really cute. The circle punch saves time but isn't essential. For all the cards on this page I just cut out circles by hand, because my circle punch was blunt. 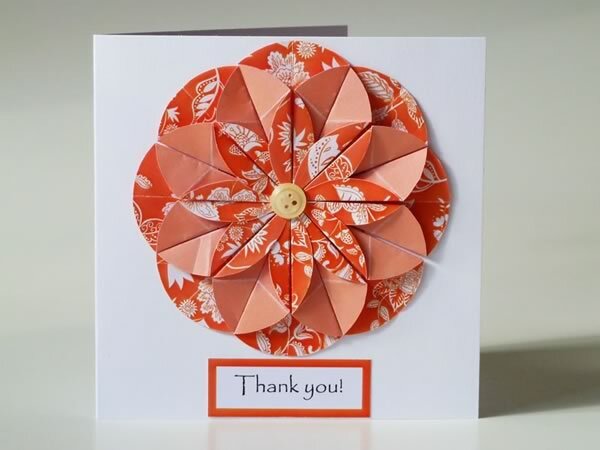 I know my cards are quite simple using only one flower, but I'm sure you can come up with many homemade card ideas by using different sized flowers or overlapping them into a bunch. Have fun! Punch out eight 2" circles. Print out this clock template which will help with assembly later. Don't have scrapbooking paper? No problem! 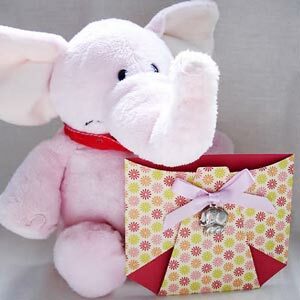 Download one my free digital scrapbooking papers below. 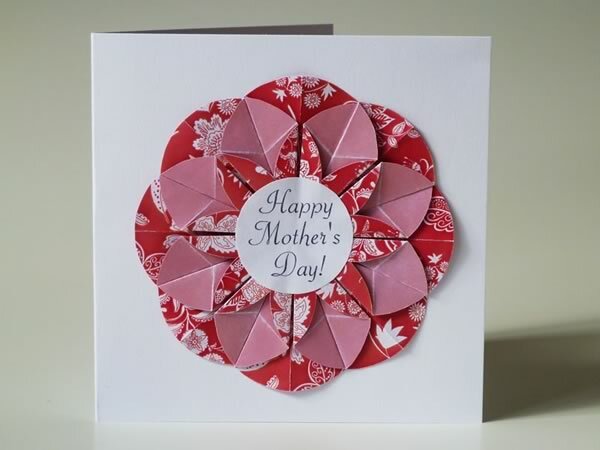 They include everything you need to make the flower for this homemade card idea. 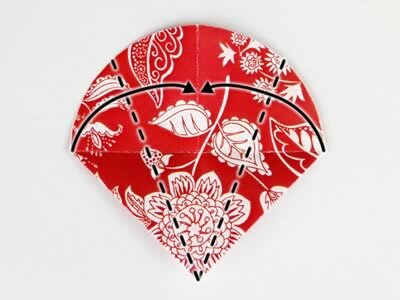 Each PDF file has 8 patterned circles with a complimentary-colored backing, plus a sheet of various sentiments which are framed with the matching color. 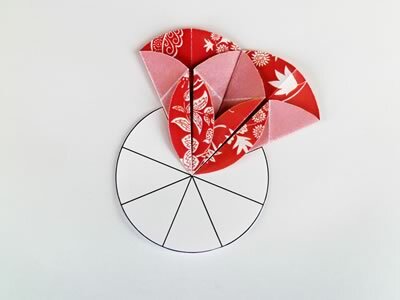 It also includes a single "clock" template, which is helpful when assembling the flower. 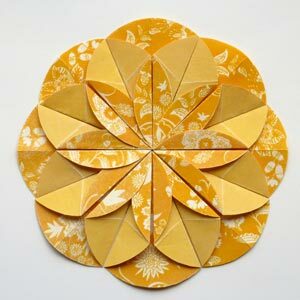 The files are designed for making flowers 4" (10 cm) across. You can use the print scaling feature in Adobe reader if you want bigger or smaller flowers. 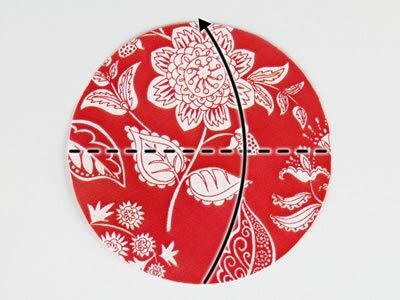 The final flower will always be double the diameter of the circle size you use. Please print the template double sided. If your printer doesn't offer a double-sided feature, then just print page 1, put the printed page back the paper tray upside down, and then print page 2. 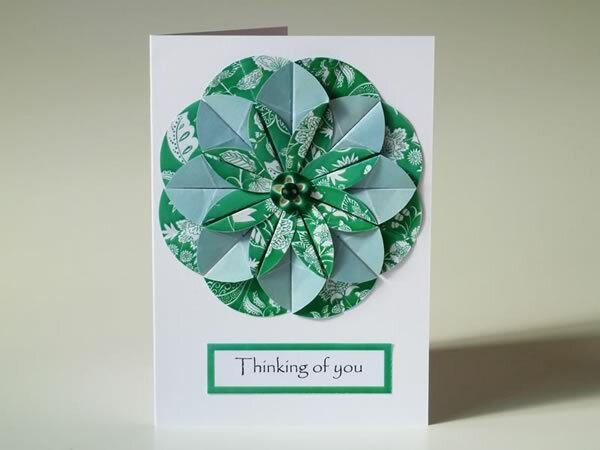 Optional: You can download circular sentiments to decorate the center of your flower instead of a button or other embellishment. 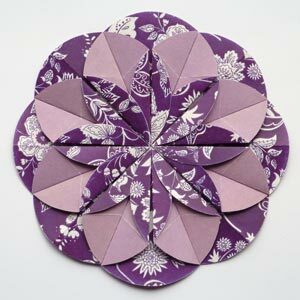 Although this flower appears very intricate, it is actually quite easy to assemble! 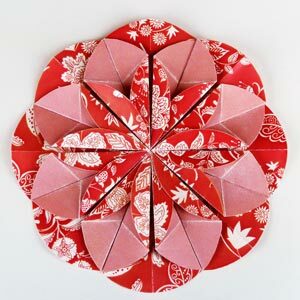 It is comprised of 8 petals, and each petals takes just a few quick folds. Once you get the hang of it, I promise it won't take you very long to make the rest, and the intricate flower design is really worth it! 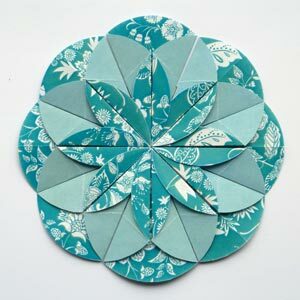 Cut out 8 circles of patterned paper (see free templates above) plus the printed out "clock circle". 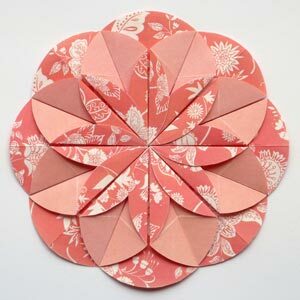 Take one double-sided circle and place it on the table patterned side up. 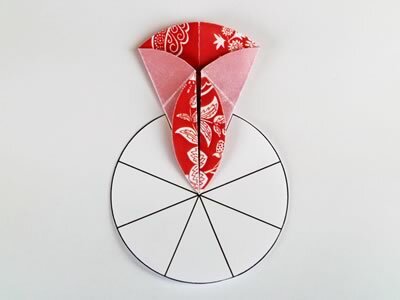 Fold circle in half. 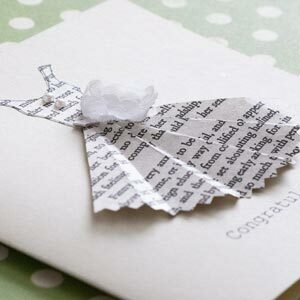 Fold down the top layer of paper as far as it will go. 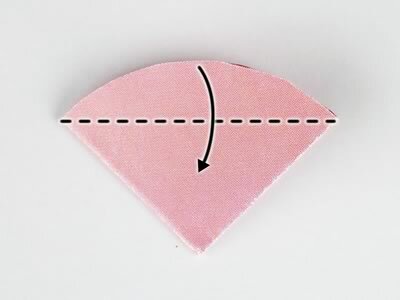 The fold should go through the left and right corners. 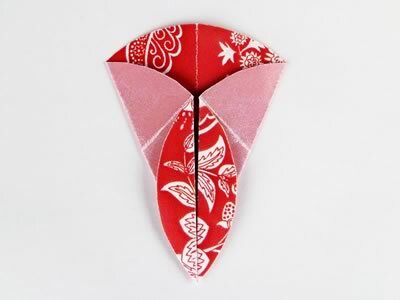 Now flip the paper over and repeat the fold on the other side. 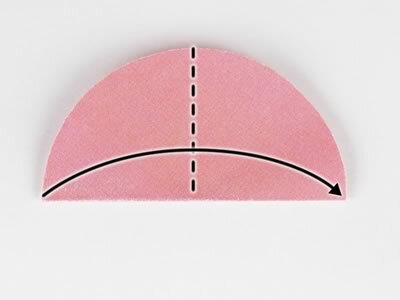 Turn the paper over and then fold each side in to meet the center line. 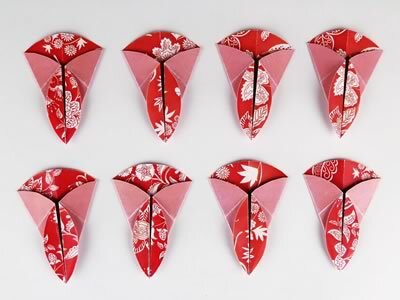 Fold more dahlia petals until you have 8 in total. Put some glue on the plain side of the pointy end of the petal. 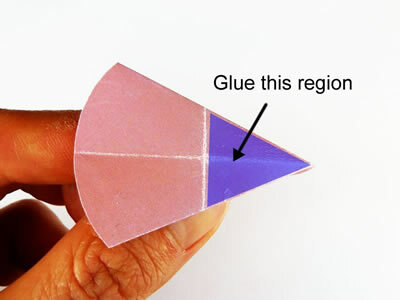 Only glue as far as the crease about half way along the petal. 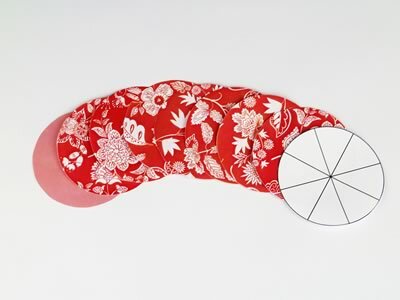 Now glue your petal down into one of the segments of your backing clock template . 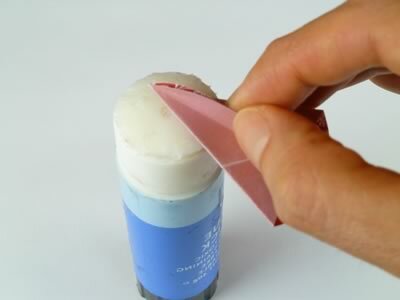 Glue on the rest of the petals one by one. Ta da! 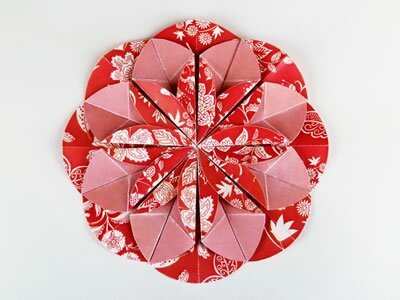 Your completed origami dahlia flower! At this stage I like to squash it in a heavy book for a few minutes just to help everything glue down in position. 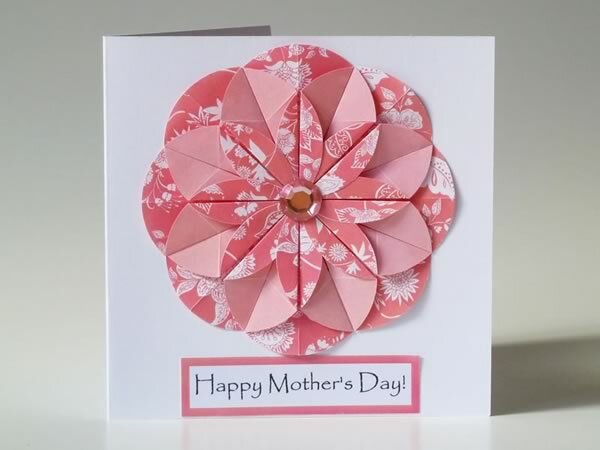 Once you've made the origami flower, it is then simply a matter of gluing the flower onto the card front. 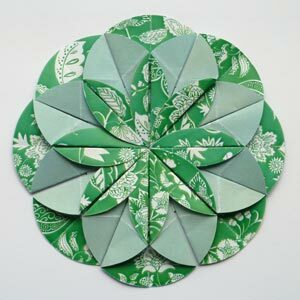 After that, you can glue a pretty embellishment, or sentiment circle, in the center of your flower. Alternatively, you could add a sentiment below the flower. 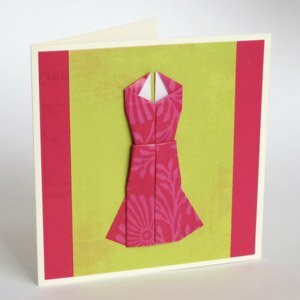 Feel free to experiment with your own homemade card ideas! Here are some finished cards I made. 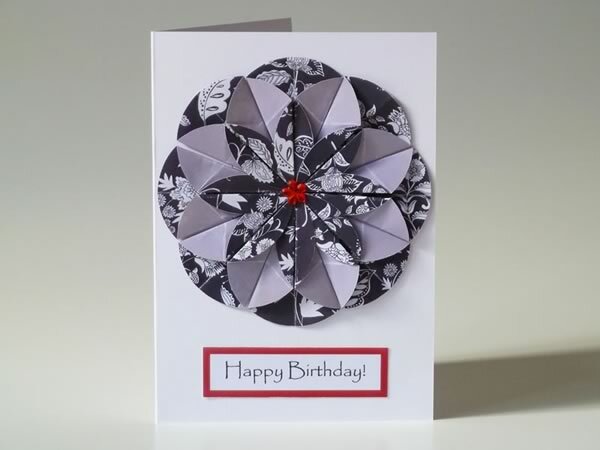 Have you made a birthday card and you're not sure what to write in it? Check out these 100+ Happy Birthday Wishes and Happy Birthday Quotes, Wishes, Videos, and Printables pages for more inspiration. 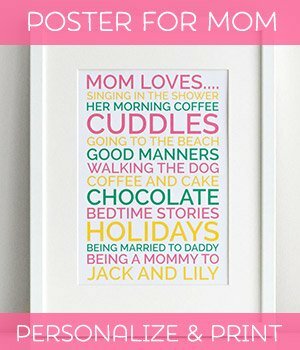 We also have a huge collection of lovely Happy Mothers Day Messages and 48 Fabulous Mothers Day Quotes, full of sweet messages to let your Mom know just how much you love and appreciate her.